If you need to avoid moisture damage to electronic and optical equipment and the term dehumidifier conjures up images of a floor mounted household device for drying rooms or laundry, then think again. Rosahl is an innovative new way to remove moisture from small cabinets starting from only one or two litres in size. It has been designed to prevent moisture damage to sensitive electronics and optics. It also stops general corrosion and tracking of PCBs. ROSAHL is a unique solid state dehumidifier. By applying a low voltage DC supply to its solid polymer electrolyte (SPE) moisture disassociates into hydrogen ions and oxygen and is expelled to the outside. It makes no noise, has a long service life, requires no maintenance, is very small and has a low running cost. It is designed to protect sensitive electronic and optical equipment from moisture and condensation damage and can be used in enclosures from 1 litre up to 2000 litres. Larger enclosures up to 8m³ are accommodated by adding additional membranes. In its smallest form the model PD3 micro dehumidifier is 25% the size of a regular AA battery; works from a 3V dc supply and is maintenance free. 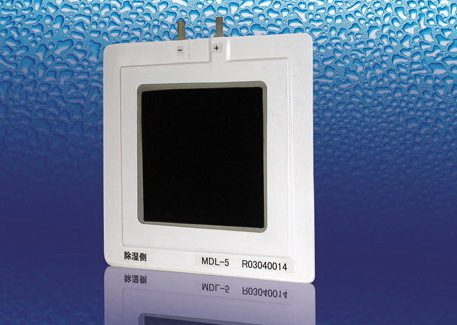 Rosahl is available in a range of sizes to match to the enclosure size and local ambient conditions. The precise drying time will depend on a number of variables such as starting and target humidity, air temperature, volume, leakage and so on. Tables are available to give users an indication on drying times. We recommend you undertake your own tests. If you are interested in scientific models for estimating drying times use the contact us section to obtain the relevant links. Why do I have a condensation problem in my electrical cabinet?